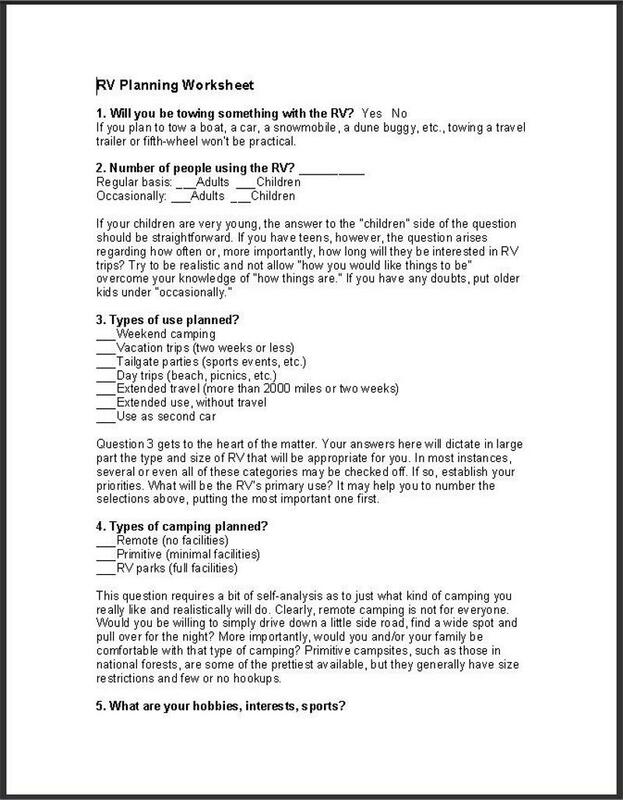 Print out this worksheet and use it, as well as the information following, to help you determine how, when and where you want to use an RV. This information may help you minimize costly mistakes. When evaluating size requirements for your RV, consider privacy of the occupants as a major factor. Time spent in the unit is another important item. For very short periods of time, most of us can tolerate too little space. But as time periods extend, the amount of space required by each person increases -- both in the area of comfort and privacy, and also when it comes to storage. Short-term use, such as day trips or tailgate parties, doesn't call for a great amount of space, but it does mean a minimum amount of setup will be a real advantage. Extended travel has very nearly identical requirements as short-term use, but with economy of operation and driving ease added. As the time of use increases, the number of people who will use the unit on a regular basis starts to be a more important factor. Also, the style of camping you are interested in will have a bearing on size. If you're interested in backroads and out-of-the-way campsites, a large-size RV can be a hindrance. As you start to narrow down the RV categories, be sure to check our glossary of RV terms. You will need to address such details as floorplan and storage space (inside and outside) requirements, and the degree of self-containment. Full self-containment simply means being able to park without any outside facilities or hookups. This would include full bath facilities; adequate freshwater supply, along with black- and gray-water holding tanks (black for the toilet, and gray for the wash basin, sink and shower); propane tanks to power the refrigerator; stove and furnace; plus 12-volt battery power for the lights, exhaust fan(s) and furnace blower. A generator is usually considered part of a complete self-containment package. While total self-containment is not absolutely necessary, it is certainly nice to have. As you define your various requirements and consider your financial situation, the type and the size of RV that will meet your needs will become more clear. Then it's simply a matter of selecting the style and brand you like best -- and start smart shopping to put yourself on the road for years of enjoyment in your new lifestyle!